Tencent, Asia’s highest-valued technology company, has smashed analyst forecasts for its Q3 2017 after it posted a profit of 18 billion RMB ($2.7 billion) on revenue of 65.2 billion RMB ($9.8 billion). That blew past expectations of 15.7 billion yuan and 61 billion yuan, according to analysts polled by S&P Global Market Intelligence, thanks to its high-performing mobile and PC gaming businesses. Overall profit was up 69 percent year-on-year and revenue rose by 61 percent thanks to Tencent’s games business, which includes both PC and smartphone. mobile cousin hit 18.2 billion RMB ($2.75 billion) thanks to 84 percent growth. Honour of Kings, the world’s most lucrative mobile app this year, was a stellar contributor, while the firm also owns League Of Legends for PC. Tencent paid tribute to the app, and a handful of others, for the growth but it didn’t break out each title’s sales. WeChat, the messaging app that Tencent is best known for, reached 980 million monthly users when combined with its sister QQ service. The services saw 38 billion daily messages between which represented 25 percent annual growth. While WeChat is one of the world’s most engaged services, Tencent doesn’t make huge amounts of revenue directly from it. Timeline advertising folds into the firm’s general ads business — which grew 48 percent to 11 billion RMB ($1.6 billion) — but WeChat is a launchpad to drive users and money into other services. For example, its payment service saw offline payment volume grow 280 percent year-on-year. That’s a sign that it is maturing from a system to send money to friends and buy digital goods, to a wider-used real world service to rival Alibaba’s Alipay or Apple Pay. However, Tencent didn’t disclose specific raw figures. The company was more specific with its video service, which it claimed has beaten out Alibaba’s Youku Tudou to become China’s most watched service on mobile. “We believe this success reflects our increasing investment in self-commissioned video content, our improved selection of licensed video content, and our scheduling and audience management initiatives,” CEO Pony Ma said in a statement. 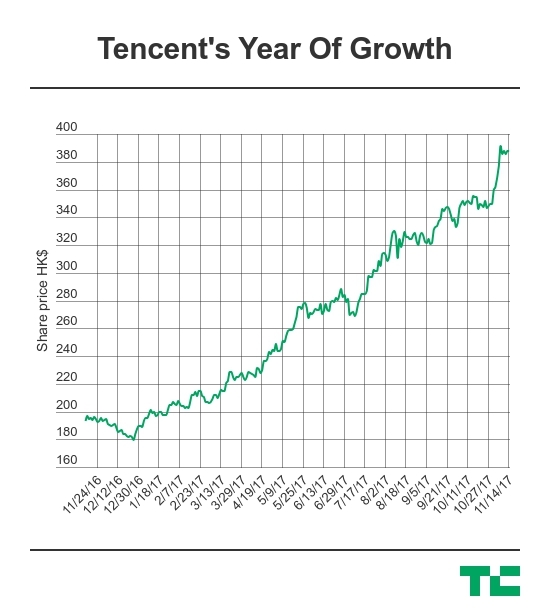 Outside of growing its services, Tencent has been busy with investments. It bought up 12 percent of Snap earlier this month, and two of its businesses — e-book company China Literature and search engine Sogou — held IPOs in recent weeks.